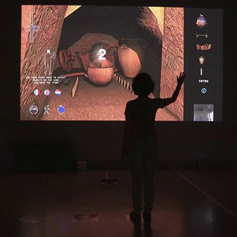 Etruscanning is a European project in the Culture 2007 framework, that focuses on using innovative 3D and multimedia technologies to support three exhibitions on the Etruscan culture. As 3D scanning will be one of the technologies used, the project name is a blend between the words Etruscan and scanning, hence Etruscanning. The innovative 3D visualisation technologies include also 3D virtual reconstruction and digital restoration. The resulting applications use natural interaction through kinekt camera and an innotive-multi track video to expolre the reconstructed environments. Objects of the project were the Regolini Galassi tomb, excavated in the necropolis of Cerveteri, and the Monte Michele number 5, in Veii. The gravegoods belonging to the Regolini Galassi tomb are today preserved in the Vatican Museumsand there is also the application that shows the reconstruction of the tomb. The gravegoods from Monte Michele number 5 tomb are preserved, on the other hand, in the National Museum of Villa Giulia. There is located the application that shows the original appearence of the tomb and the history of archaeological excavation.